CLICK DOWNLOAD FOR ZIP FILE OF WALLPAPERS!!! And comments will be "It would have been nicer if you uploaded a bigger pic for you to see bla blah"
And that's why I brought new year gifts for everyone, WALLPAPERS!!! "An energetic boy chosen as the warrior of the Seiryuu clan, Takao seeks to master the Secret Arts of his family. With his grandfather as his sensei, he trains at the dojo almost everyday... or at least whenever he feels like it. Takao would always try to sneak out of training to meet up with his friends. Little did he know that he is the descendant of the greatest samurai in the land. Will he ever focus on discovering his true power? Or will he value what he has as of the moment and protect his friends instead?" 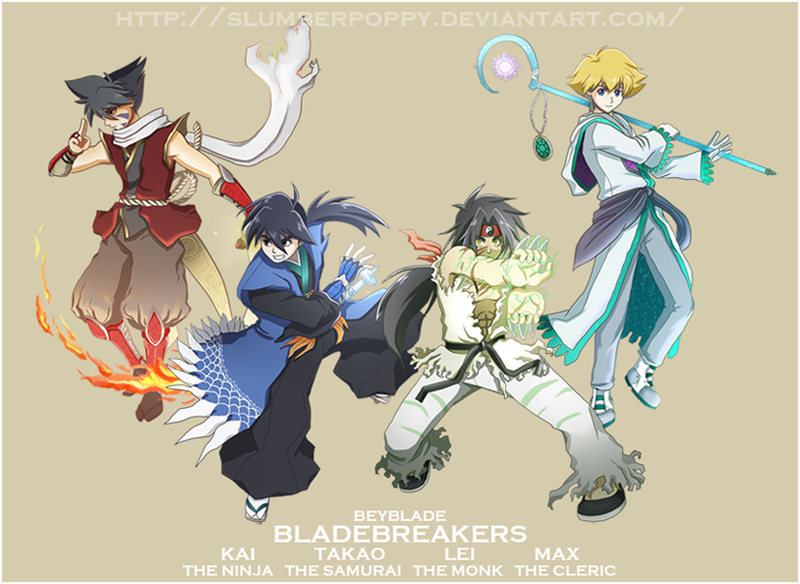 "Kai is the grandson of the Suzaku clan's leader, and he is the only heir remaining. Ever since his clan's loss with the Seiryuu family, Kai decided he would one day defeat the enemy's heir and bring honour to his family name. Cold and mysterious, Kai doesn't really reveal his identity to anyone and little is known about his past. 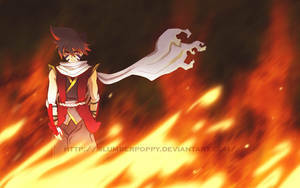 He lost part of his memories after receiving the power of the Suzaku as a kid. He is on a mission to look for the Scroll of the Black Phoenix, a powerful weapon which was once possessed by his grandfather but was sealed by the enemy clan. The greatest question will remain; is Kai a friend or a foe?" 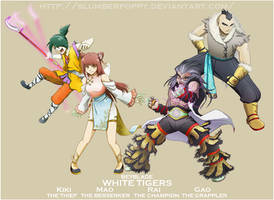 "Living in the small village of the White Tiger clan, Lei is hailed as the strongest fighter of the land. He was immediately chosen by the Byakko to receive its power at a young age even though he wasn't of royal blood. After this, his curiosity was piqued when he read more about the different clans outside the village. Lei sets out on an adventure to discover the other mythical beasts wielded by the different clans. This, however, gave him an impression of being a "traitor" by his clan and the Royal White Tiger family. Notorious in his home clan, will Lei forever be in hiding and continue his journey, or will he once again seek the place he once called home?" "The cheerful and friendly son of the Fairy queen and an Enchanted gem refiner wields the power of the Genbu When the previous Queen passed away, she promised the protection of the great waters to her grandson. In the near future, Max will be given the responsibility to defend his land from invaders and attackers who wish to discover the Aqua magic and the technology that generates the energy from water. When the Fairy queen hesitantly allows Max to travel with his father to another land, he meets a samurai from the Seiryuu clan and befriends him. However, Max is not aware about the conflict between clans. Is he risking the security of his life and of his kingdom?" 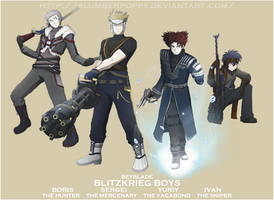 This is really cool, and i love the descriptions that you added to each of them. Is this going to be a real manga? I REALLY WANT TO READ IT!!!!!! nice. 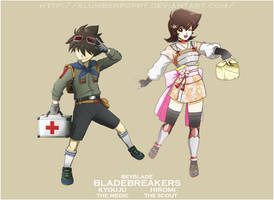 I love the outfits you designed for them. and their rolls are perfect XD. just way too awesome! Very cool, though different from how I would see a Genbu-type dude. I went with armor and shields. The color is fine lol. Ah. Nice. My Genbu is in a pair. Also note I didn't draw this, its just my design. I never liked him. But now I do, because of you. This is really cool! 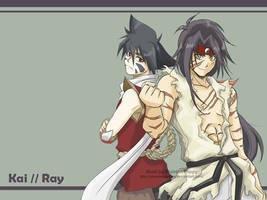 I love the clothing design and nice touch there with Ray's name. Heh, to be completely honest I was like "wat" And then I watched a Chinese episode and wow. You learn something everyday. Can't wait!! 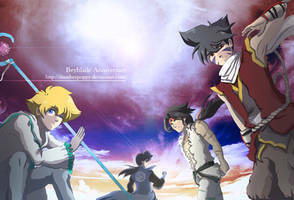 ^^ Iv'e looked at all the other Beyblade pictures you got and they all look amazing!! 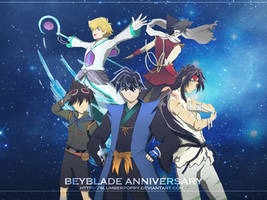 Great job I love Beyblade!! Hoooo!! Technically the original name in Japanese is Rei Kon. omg! these are wonderfull!! i was wondering if i can you the clothes idea and fight moves for this fan fic im working on! 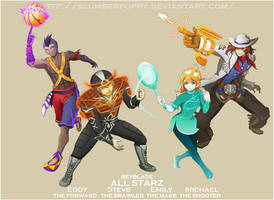 of full cred goes to you for the outfits and moves (i have a diffrent backgroud in mind for some of them)! really!? thats awesome! though im still working on some of the characters profile and what not i'll give you the link as soon as i can! 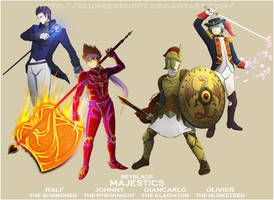 Almost forgot, those guys the Majestics beat. The ones that imitate monsters were all know, the mummy, vampire, frankenstein and werewolves.